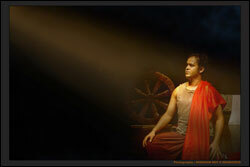 Ranga theatre, one of the well known groups in Hindi theatre, has an immense story behind it. Behind the production house, is the man with a mission, Bijon Mondal, the founder. Bijon is a theatre director and artist, made his impressions in classical plays with fusion. In our small chit-chat today, he shares some thoughts and experiences. How was the journey so far? It has been very interesting. I started my work at Prithvi doing several things helping out with productions, the Prithvi theatre festival, its Summertime festival, with design and technicalities. I was the Technical Manager and was also working with different groups as a light designer, as choreographer, etc. I mounted my own production KARNA in 2007. Today, our plays are getting a good response from the audience, both adults and children, as well as our theatre community. We have performed at various festivals in India and abroad. What makes Ranga theatre unique? We make a blend of classic plays, with various elements of music, physical theatre elements, technical aspects which cater to modern audience. We experiment and fusion in our plays while we ensure audience enjoy and get the message. Where do you see the future of Ranga theatre and theatre arts in general? It's getting richer reach. More people are investing in theatres. Regular income, like they've in the West, may lead to full fledged career for performing arts. With Ranga, we're looking to make new productions and shows all the time. If not this, where would you've been? (Laughs) I'd have been playing cricket. What excites you the most about Mumbai? Mumbai lets me experience different genres and languages of theatre arts, in one city. It's nowhere in India. Also, people encourage arts here and are ready to pay. Which do you consider the best play of yours? Andha Yugh. It was challenging and interesting. Lot of adoptions of this play, has been already done. Hence, this was a challenge to me giving a fusion. Mr. Satyadev Dubey, the original creator of play, has graced his presence for the show and helped me enhance the play. It was best part. When can we see you behind the big screens of film industry? A brief of future plans? More and more plays. Every form of performing arts. Film is an extension of theatre arts. Count of audience is the only difference. I want to make Classic films, like the plays we do in Ranga. What do you advice to the younger aspirants? Have Patience. Give yourself enough time to strengthen roots, before entering professional industry. Lot of youngsters fade away in one or two big opportunities due to weak skills and inexperience. I've become my own version of optimist. If I can't make it through one door, I'll go through another, or I'll make my own. Something terrific will come, no matter how dark the present.